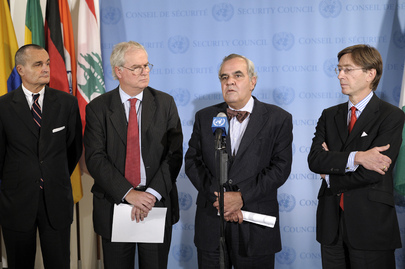 UNITED NATIONS, October 9 -- In the wake of the European draft resolution on Syria failing in the UN Security Council, differences between the four European members of the Council have come into focus. As exclusively reported by Inner City Press last week, the United Kingdom has taken the lead in questioning the proposed new prominence of the European Union in UN General Assembly affairs. The result? All week in the committees of the General Assembly, the EU did not speak. The UK has some innovative ideas about the UN Department of Peacekeeping Operations that one hopes to see implemented, even with the fourth Frenchman in a row put in charge of DPKO. Germany, beyond joining the US in voting "no" on Palestinian membership in UNESCO, led the charge in slowing Palestine's application in the Security Council in a closed-door meeting on October 7, again as exclusively reported by Inner City Press. Germany has generally served the press well day to day. Of France we have and will have much to say. They try to block inclusion of a human rights mandate for the UN Mission in Western Sahara, MINURSO. It was France's open flouting of Resolution 1973's arms embargo on Libya, by air dropping weapons into the Nafusa mountains, that it pointed to by other Council members for distrusting the "motives" behind the now-failed Syria draft. We will focus below on Portugal, as the European member of the Council which neither has nor aspires to have a Permanent seat. Even Syrian Permanent Representative Bashar Ja'afari, when he indicted the resolution's sponsors at his post-vote stakeout, forgot Portugal until Inner City Press asked what Portugal ever did to Syria. Ja'afari paused before saying, they were colonialists, see what they did in Africa. But even in these former colonies, at least those on the agenda of the Security Council, Brazil has been taking the Lusophone lead. Portugal has taken the role of the "soft" European. France, for example, accuse Portugal of being "soft" on referring Libya and Gaddafi to the International Criminal Court. Portugal responded, not entirely unlike India, that the referral to the ICC perhaps ought to be part of a sequence, not done in Resolution 1970. This has led some to think that Portugal might break from the otherwise negative response by the European members to Palestine's application for UN membership. But that does not appear to be the case. Portugal began its two year tenure on the Council with an attempt to chair the Committee on Working Methods, to advance what its Permanent Representative Jose Filipe Moraes Cabral says its commitment to transparency. But the Permanent Five, distrusting this, pushed to give the chair to Bosnia, with a promise Portugal could take it in January 2012. After that, Portugal's highest profile assignment has been as chair of the Libya Sanctions Committee. It has not been the most aggressive chairmanship. The affable Cabral is more open than most of his Council, particularly European, peers. Cabral's subordinates continued with the work, but either weren't or didn't think they were authorized to speak as much. Coverage suffered. Repeatedly the press asked the Portuguese, what about this evidence that France is violating the sanctions and arm embargo regime? Finally Cabral gave Inner City Press one of the quotes of the year, that the Council "is not a society of masochists" -- that is, that nothing would be done. And so it happened. With Portugal slated to take over the committee on working methods in January, it will have a chance to leave a mark on the Council going forward. Will it? Watch this site.